TLJ News: March 26-31, 2004. The FASB's comment period for the exposure draft ends June 30, 2004. See, full story. 3/31. Rep. Chris Cox (R-CA), the Chairman of the House Homeland Security Committee, gave a speech in which he addressed, among other topics, cyber security. Rep. Cox (at right) stated that "private sector cooperation is indispensable to our effort to reduce infrastructure vulnerabilities. The private sector not only owns most of our critical infrastructure, but it also has both vital information and the expertise we need to fix our problems. The corporate world must stand ready to cooperate. But, the Federal Government must commit itself to building trust and confidence, not to threatening regulation before a constructive dialogue is engaged." He continued that "The Government can foster, it can enable. But the lesson of the 20th century is that it cannot supplant the role of private industry, or of the entrepreneurial urge that brings to market a multiplicity of potential solutions to each once-intractable problem." Rep. Cox added that "cybersecurity is today the most significant challenge and the most promising opportunity for our Government and private sector to reduce a major and growing national vulnerability." He elaborated, "Simply put, we depend on it. You own it. Our financial institutions, power plants, nuclear facilities, government agencies, borders, and other critical infrastructure rely upon internet-based technologies. Our reliance on Cyber in fact reflects the exponential net gain of knowledge over the past decade. Our pervasive dependence on information and communication systems affects every aspect of our lives." "The good news is the potential that technology represents to improve the quality of life around the world. But there is also bad news; this growing reliance makes our cyberspace a viable, high-gain target for terrorists. Right now, we are not where we need to be. As we all know, we need to do more and the responsibility for this is shared. By harnessing the technical resources of the private industry and the intelligence capability of the federal government, we begin a partnership that can prevent, protect, and respond to cyber attacks", Rep. Cox concluded. 3/31. All five of the Commissioners of the Federal Communications Commission (FCC) wrote a letter to telecommunications carriers and trade associations regarding the opinion [62 pages in PDF] of the U.S. Court of Appeals (DCCir) in USTA v. FCC, vacating parts of the FCC's latest rules (contained in the triennial review order) regarding the unbundling requirements of incumbent local exchange carriers (ILECs). The letter states that the FCC will seek an extension of the Court of Appeals' stay of its vacatur. The letter also encourages the incumbent and competitive carriers, and their trade groups, to use this time to negotiate. See, letter [PDF] sent to CompTel, and statement [PDF] released by the FCC. See, full story. 3/31. The House Judiciary Committee's Subcommittee on Courts, the Internet, and Intellectual Property amended and approved, by voice vote, HR 3754, the "Fraudulent Online Identity Sanctions Act". 3/31. The House Judiciary Committee's Subcommittee on Courts, the Internet, and Intellectual Property approved HR 4077, the "Piracy Deterrence and Education Act of 2004". This is the successor bill to HR 2514. 3/31. The House Judiciary Committee's Subcommittee on Courts, the Internet, and Intellectual Property amended and approved, by voice vote, HR 3632, the "Anticounterfeiting Amendments of 2003". 3/30. Intel announced in a release that it "has settled the remaining issues in a patent infringement suit pending in U.S. District Court in Marshall, Texas relating to Intel's Itanium® microprocessors. Under terms of the settlement Intel and Intergraph will move for dismissal of the case with prejudice. As a result, neither company has any further financial obligations under an earlier April 2002 settlement agreement." Intel added that "under terms of the current settlement Intergraph has granted Dell Inc. certain licenses to Intergraph patents and agreed to dismiss Intergraph's separate pending litigation against Dell. Intergraph sued Dell for patent infringement in December 2002. This agreement gives Dell a license to all Intergraph-owned patents, and covers past, present and future Dell products." Intergraph stated in a release that it "has resolved its patent infringement claims against Dell Inc. with regard to its Clipper patents. In addition, the settlement resolves Intergraph's dispute with Intel Corporation regarding the Company’s Parallel Instruction Computing (PIC) patents. Under the settlement agreement, Intel will pay Intergraph $125 million on April 5, 2004. Four subsequent $25 million cash payments will be made by Intel on July 5 and October 5, 2004 as well as January 5 and April 5, 2005. Intergraph estimates its total intellectual property income for the first quarter of 2004, net of all fees and expenses, will be approximately $203 million." 3/26. President George Bush gave a speech in Albuquerque, New Mexico in which he addressed a variety of economic and commercial issues, including broadband deployment, free trade, and litigation reform. He stated that "We ought to have a universal, affordable access for broadband technology by the year 2007, and then we ought to make sure as soon as possible thereafter, consumers have got plenty of choices when it comes to purchasing the broadband carrier." In his Albuquerque speech he stated that "I want to talk about one other thing we've got to do to make sure this is a good place for people to realize their dreams and start a business and get well educated, is we've got to make sure this country is on the leading end of broadband technology. You see, new ideas and new businesses and new ways to educate people in Farmington, New Mexico are going to occur when we're able to get information flowing across cables and telephone lines in a fast way. That's what broadband technology is. It means we'll open the highways of knowledge -- new highways of knowledge." Bush continued that "This country needs a national goal for broadband technology, for the spread of broadband technology. We ought to have a universal, affordable access for broadband technology by the year 2007, and then we ought to make sure as soon as possible thereafter, consumers have got plenty of choices when it comes to purchasing the broadband carrier. See, the more choices there are, the more the price will go down. And the more the price goes down, the more users there will be. And the more users there will be, the more likely it is America will stay on the competitive edge of world trade." Bush emphasized telemedicine and distance education. "The more users there are, the more likely it is people will be able to have interesting new ways to receive doctors' advices in the home. The more affordable broadband technology is, the more innovative we can be with education. It's important that we stay on the cutting edge of technological change, and one way to do so is to have a bold plan for broadband." "Let me say one thing about broadband -- we don't need to tax access to broadband. The Congress must not tax access to broadband technology if we want to spread it around", said Bush. "The role of government is to create an environment in which the entrepreneurial spirit is strong, and in which people are able to realize their dreams." Bush referenced Farmington, New Mexico in his speech. Farmington is a small town in a region that people at the Federal Communications Commission (FCC) describe as "Indian Country". For example, FCC Chairman Michael Powell gave a speech on February 3, 2004 titled "The Importance of Telecom in Indian Country". He stated that "Innovative telecommunications products and services appear almost daily -- VoIP, digital TV, smart radio, and wireless applications just to name a few. Indian Country must be a part of this technological revolution. Information technology and access to telecommunications as a means of economic empowerment is essential to the future growth and strengthening of tribal life -- bringing significant benefits to Tribal financial, social, political, healthcare and educational systems." See also, the FCC's Tribal Initiatives web page. President Bush has only rarely spoken on broadband, internet, or telecommunications issues. He gave a speech on June 13, 2002 in Washington DC. He stated then that "This country must be aggressive about the expansion of broadband". As in his Albuquerque speech, he opposed taxes. Although, on June 13, 2002 he expressed opposition to "access taxes on the Internet", while in March 26, 2004, he expressed opposition to taxes on "access to broadband". See also, story titled "Bush Talks About Broadband Deployment" in TLJ Daily E-Mail Alert No. 451, June 14, 2002. He also gave a speech on August 13, 2002 in Waco, Texas in which he stated that "In order to make sure the economy grows, we must bring the promise of broadband technology to millions of Americans. My administration is promoting investment in broadband. We will continue to work to prevent new access taxes on broadband technology. If you want something to be used more, you don't tax it. And broadband technology is going to be incredibly important for us to stay on the cutting edge of innovation here in America." Bush received praise for his comments about broadband deployment. For example, FCC Chairman Michael Powell released a statement [PDF] about the President's speech. "The president has set out a bold vision for broadband investment and deployment over the next four years. I look forward to working with my commission colleagues, Congress and the administration to deliver on this vision for the American people. Universal and affordable access to broadband is vital to the health and future growth of our economy." BellSouth's Margaret Greene stated in a release that "BellSouth is happy to see telecommunications policy getting attention at the highest level of the federal government. BellSouth will work with the Administration as it sets out a pro-investment market-based national of policy to encourage investment in telecommunications infrastructure and to realize the President's vision of high-speed internet access available to everyone. The President's emphasis on the importance to the economy of these advanced services is right on target." Walter McCormick, P/CEO of USTA, stated in a release that "We applaud the President for setting a clear goal for full deployment of the most important technology of our time. We look forward to working with his Administration on policies that will promote investment and speed the delivery of new broadband choices, services and opportunities into every American community." 3/26. President Bush's speech in Albuquerque, New Mexico on March 26, 2004 may be significant not only for what he said, but also for what he did not say. In past speeches about broadband, he has advocated broadband deployment, and expressed confidence in the Federal Communications Commission (FCC) to implement the appropriate policies. In his speech on March 26 he again advocated broadband deployment, but said nothing about the FCC. President Bush has only rarely spoken about broadband. However, in two speeches on broadband policy in the summer 2002, President Bush advocated broadband deployment, opposed internet access taxes, and expressed confidence in the FCC to implement policies that promote broadband. In his most recent speech he advocated broadband deployment, and opposed internet access taxes, but omitted the expression of confidence in the FCC to promote broadband. In his speech on June 13, 2002, he said, "And, of course, a lot of the action is going to come through the FCC. I know that, you know that. I'm confident that the chairman and the board is focusing on policies that will bring high speed Internet service, will create competition, will keep the consumers in mind, but to understand the -- kind of the economic vitality that will occur when broadband is more fully accessible." In his speech on August 13, 2002 in Waco, Texas, he said, "The Federal Communications Commission is focusing on policies to encourage high-speed Internet service for every home and every business in America." On Friday, March 26, 2004, he had nothing to say about the FCC. In contrast, he found time to praise the acting Secretary of Housing and Urban Development, the Mayor of Farmington, New Mexico, and various ordinary citizens of New Mexico. This raises the question: what has changed between the summer of 2002 and today that might have led the President to stop expressing confidence in the FCC? One plausible answer is that the President perceives that broadband deployment policies must now be implemented by a variety of entities. For example, reallocating certain spectrum for wireless services may involve the National Telecommunications and Information Administration (NTIA). Legislation involves the Congress. Another possible answer is the triennial review order (TRO). The FCC was sharply divided an several items in the TRO. And Chairman Powell failed to obtain a majority on some of the items that he sought. But, Bush has never said anything publicly about the bundling requirements of incumbent local exchange carriers (ILECs), the triennial review order, the March 2, 2004 opinion [62 pages in PDF] of the U.S. Court of Appeals (DCCir) in USTA v. FCC, or any petition for writ of certiorari. Moreover, the TRO basically provided regulatory relief on the issues most clearly related to promoting broadband deployment. The FCC announced the TRO on February 20, 2003. See, stories titled "FCC Announces UNE Report and Order", "FCC Order Offers Broadband Regulatory Relief", "FCC Announces Decision on Switching", "Commentary: Republicans Split On FCC UNE Order", and "Congressional Reaction To FCC UNE Order" in TLJ Daily E-Mail Alert No. 609, February 21, 2003. The FCC released the text of the triennial review order [576 pages in PDF] on August 21, 2003. See, story titled "Summary of FCC Triennial Review Order" in TLJ Daily E-Mail Alert No. 725, August 25, 2003. And, the Court of Appeals vacated parts of the TRO on March 2, 2004. See, story titled "Appeals Court Overturns Key Provisions of FCC Triennial Review Order" in TLJ Daily E-Mail Alert No. 848, March 3, 2004. The TRO contains some provisions that may promote broadband deployment, particularly, pertaining to next generation broadband facilities. For example, the TRO provides that there is no unbundling requirement for fiber to the home (FTTH) loops. Commissioners Powell, Abernathy and Martin, Republicans all, formed the majority on the FCC on these issues. The Court of Appeals upheld these provisions. However, the TRO did not provide regulatory relief to the ILECs on switching. It provided that "An incumbent LEC shall provide a requesting telecommunications carrier with nondiscriminatory access to local circuit switching, including tandem switching, on an unbundled basis ..." The TRO provided that switching, a UNE-P element, for business customers served by high-capacity loops such as DS1 will no longer be unbundled based on a presumptive finding of no impairment. But, states will have 90 days to rebut the national finding. Also, for mass market customers, the TRO sets out specific criteria that states shall apply to determine whether economic and operational impairment exists in a particular market. Commission Martin voted with the two Democratic Commissioners -- Copps and Adelstein -- on this issue. The Court of Appeals vacated those portions of the TRO in which the FCC delegated decision making authority to the states to make impairment findings. But then, this is a telephone industry issue, involving legacy networks. ILECs argue, however, that this is a broadband related issue, because so long as the ILECs are required to provide access to their facilities at below cost prices, they will not be able to raise all of the capital that they need to build new broadband facilities. The TRO also eliminated line sharing as an unbundled network element. The line sharing provisions provide regulatory relief to the ILECs. However, the line sharing provisions do not share the same rationale as some of the other broadband related provisions, such as FTTH. That is, the main rationale for not requiring an ILEC to provide unbundled access to FTTH loops is to incent ILECs to invest in deploying fiber networks. But, the copper networks to which line sharing applies already exist. Commissioners Martin, Copps and Adelstein formed the majority on this issue. The Court of Appeals upheld the line sharing provisions of the TRO. Perhaps there is no significance to the fact that President Bush did not express confidence in the FCC, as he did in his earlier speeches on broadband policy. Perhaps the omission was unintentional. Or maybe the transcript of the speech released by the White House press office inadvertently omitted a portion of the speech. (TLJ did not attend the event where Bush spoke.) On the other hand, it might be a subtle reflection of the President's view of the FCC's broadband related efforts, and the TRO in particular. 3/26. Federal Communications Commission (FCC) Commissioner Michael Copps gave a speech on Capitol Hill in which he advocated FCC involvement in assuring broadband network neutrality. He stated that "End to end openness has always been at the heart of what the internet community and its creators celebrate. The internet has become a fountain of innovation, a well of opportunity for consumers, and for entrepreneurs. It may just be the most democratic public forum that has ever existed." Copps (at right) continued that "this internet may not be the one that we know in the future. There are threats to it out there, and I think that we have better begin to understand them before they derail the promise of this technology, not after the damage has been inflicted. Entrenched interests are already jockeying to constrain the openness that has been the internet's defining hallmark. They are lobbying the FCC to aide and abet them. They claim all they are advocating is a deregulated environment, where the market can reign supreme. But, in reality, they are seeking government help to allow a few companies to turn the internet from a place of competition and innovation, into an oligopoly." He explained that "Power over the internet would reside with the network owners, with a huge choke point, constrain consumer choices, limit sources of news and information and entertainment, undermine competitors, and quash disruptive new technologies. They may talk in terms of Schumpeter and creative destruction, but in reality, what they are asking is for the Commission to pick winners and losers, and to choose existing technologies and businesses over new technologies and entrepreneurs. They can talk competition all they want, but the race to combine distribution and content spell economic constraint here, just as clearly as they did when John D. Rockefeller married distribution to his product." Copps argued that "We cannot afford to buy into this vision." He also speculated on the possible consequences of the absence of network neutrality. "Consider what might happen if your broadband internet provider could discriminate. It might, for example, choose prevent you from using a spam jamming service that blocks its own spam, or a filtering technology to keep you from cruising the back alleys of the internet. Maybe, it is not mere fantasy that someday, somebody might want to decide which news sources, or political sites, you can visit. We ought to at least be thinking about this matter, and maybe even taking some steps to ensure that it doesn't happen. He also praised FCC Chairman Powell's speech [PDF] titled "Preserving Internet Freedom: Guiding Principles for the Industry" at the Silicon Flatirons Symposium at the University of Colorado School of Law in Boulder, Colorado on February 8, 2004. Powell argued for a concept that he called "Net Freedom" -- the concept that consumers should be able to use their broadband connections to "use the content, applications and devices they want", without restrictions imposed by their broadband service providers. Powell argued that at this time "the case for government imposed regulations regarding the use or provision of broadband content, applications and devices is unconvincing and speculative". However, he outlined a voluntary "road map" of rules to be followed by broadband service providers. He stated that this "Net Freedom" should include the principles that "consumers should have access to their choice of legal content", "consumers should be able to run applications of their choice", and "consumers should be permitted to attach any devices they choose to the connection in their homes". See, story titled "Powell Opposes Regulations to Impose Broadband Network Neutrality" in TLJ Daily E-Mail Alert No. 833, February 10, 2004. Commission Copps stated that "I was pleased to read that recent speech by Chairman Powell, setting out some key principles of internet freedom, the freedom to access content, use applications, attach personal devices, and obtain service client information. It is, I hope, a sign that a deeper discussion may finally be starting, and that we may be developing consensus around the idea that there may just be some problems here after all. I saw his comments as a call to action for the broadband industry." Copps added that the FCC must insure that broadband networks "are accessible, neutral and open, just as they are in the dial up world." The concepts of network neutrality and nondiscrimination have been developed in more detail in several written comments submitted to the FCC. For example, the Coalition of Broadband Users and Innovators (CBUI) has filed numerous comments with the FCC urging that it write a nondiscrimination rule. See especially, comment [3 pages in PDF] filed on November 18, 2002, and comment [23 pages in PDF] filed on July 17, 2003. See also comment [17 pages in PDF] submitted by law professors Lawrence Lessig (Stanford) and Timothy Wu (University of Virginia) on August 22, 2003 urging that the FCC adopt a network neutrality rule. See also, story on this subject titled "Cato Study Opposes FCC Imposition of Network Neutrality", January 12, 2004, also published in TLJ Daily E-Mail Alert No. 816, January 15, 2004. Commission Copps was the opening speaker at an event on Capitol organized for the purpose of advocating the principles of network neutrality to Congressional staff and others. Professors Lessig and Wu were among the other speakers, as were Vint Cerf of MCI WorldCom and Earl Comstock, who represents Earthlink. 3/26. President Bush also spoke about trade and isolationism in his March 26 speech in Albuquerque, New Mexico. He argued that "Economic isolationism will lead to economic stagnation". He did not, however, reference outsourcing of jobs offshore. He stated that "Presidents before me in both political parties made decisions to make sure America's markets were open for goods produced overseas. It made sense in many ways. It helped keep consumer prices down. It helps the consumer when there's competition." "My attitude is, if our markets are open, I want the other people's markets to be open. My attitude is -- my attitude is instead of walling each other off, like the economic isolationists want us to do, let's be confident. Let's trust in our entrepreneurs. Let's understand our farmers and ranchers are the best at the world. Let's say, if you trade with us in an open way, you got to open up your market. That's the Bush policy -- you open up your market so we can compete", said Bush. He continued that "Economic isolationism will lead to economic stagnation. We can't have that. If we want people working, we've got to be confident in our ability to compete. A lot of people make a living here in America because their products they make are sold overseas. We're good at things in this country. When you see that label ``Made in the U.S.A.,´´ you know you got yourself a quality product. I want ``Made in the U.S.A.´´ sold all over the world." He concluded that "What I'm telling you is in order to be -- make sure people can find work and retain a job, we got to make sure this economy grows. These are what we call pro-growth policies. They say we understand that the vibrancy of the country is in the small business sector. We're vibrant when we make sure the entrepreneurial spirit is strong." It may be recalled that President Bush asserted, back on March 5, 2002, that "we're a free trading nation", as he explained why he imposed a 30% tariff on the importation of certain steel products from certain countries. See, story titled "A Free Trading Nation" in TLJ Daily E-Mail Alert No. 382, March 6, 2002. 3/26. 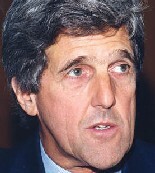 Sen. John Kerry (D-MA) gave a campaign speech in Detroit, Michigan in which he addressed outsourcing. He offered a proposal to change the tax code that he stated would encourage U.S. companies not to outsource jobs outside of the U.S. And when he finished, he asserted, "I am not protectionist". Sen. Kerry (at left) said "Today, I’m announcing a new economic plan for America that will put jobs first." He stated that "Our Jobs First economic plan will end laws that encourage companies to export jobs while plowing back every dollar we save into new incentives to help companies create and keep jobs in America." He elaborated that "We now have a tax code that does more to reward companies for moving overseas than it does to reward them for creating jobs here in America. So if I am elected President, I will fight for the most sweeping international tax law reform in forty years -- a plan to replace tax incentives to take jobs offshore with new incentives for job creation on our own shores." "Today in America if a company is trying to choose between locating a factory in Michigan or Malaysia, our tax code has a feature called “deferral” that provides major tax savings if they locate abroad. So companies are driven to take advantage of legal tax incentives that have been on the books for too long and do not serve the economic interests of our nation", said Kerry. Kerry said that he will end this. He added, "And I also propose to use the money we save from ending this tax giveaway for outsourcing to finance smart tax cuts that will create jobs here in America. Last August, I proposed a new jobs credit that would give manufacturers a break on the payroll taxes for every new worker they hire. I believe we should expand it to industries outside manufacturing where jobs are endangered by outsourcing -- so that we help create more jobs, whether it comes to cars or computer software or call centers." He also said that his proposed tax law changes would enable him to "expand jobs tax credit to cover all small businesses and their employees" and to "finance a 25% tax credit for small businesses when they provide health care for their workers". On a related subject, Sen. Kerry stated that "The Bush Administration has refused to enforce our trade agreements" and that this "costs jobs". He focused on the People's Republic of China. He complained that "they manipulate their currency to inflate their exports and depress ours" and that the Bush administration has not acted. He also complained that labor and environmental provisions should be "in the core of every trade agreement". Kerry did not, however, mention violation of intellectual property rights in China, the Chinese government's lack of enforcement of IPR, or the PR China' discriminatory taxation of digital circuits made by non-Chinese manufacturers. On November 17, 2003, Sen. Tom Daschle (D-SD) and Sen. Kerry introduced S 1873, the "Call Center Consumer's Right to Know Act of 2003" a bill requiring call centers outside of the U.S. to disclose their location at the beginning of every telephone call or internet communication to or from the U.S. See, story titled "Senators Daschle and Kerry Introduce Call Center Protectionism Bill" in TLJ Daily E-Mail Alert No. 782, November 19, 2003. Kerry asserted in his speech that "No one should misunderstand me: I am not protectionist". Go to News from March 21-25, 2004.